International Development Minister Rory Stewart offers thanks to humanitarian workers. If you combine the number of people affected by conflict, natural disasters, disease and extreme poverty around the world they would form the tenth most populous country on earth. The UK is a global leader in responding to humanitarian crises and today, on World Humanitarian Day (Friday 19 August), we pay tribute to the brave aid workers who risk their lives to help those caught up in conflict and disaster. Conflict, natural disasters and poverty mean that right now there are over 125 million people in need of life-saving aid - a level of human suffering not seen since the Second World War. Many of these terrible problems happen in countries where security is difficult, and where individuals are choosing to risk their lives to save others by delivering water, food, shelter, and medicine to people in need. We offer our sincerest thanks to them on World Humanitarian Day. By helping countries better prepare for and deal with long-term crises, we are helping to build a more stable, secure and prosperous world for all. 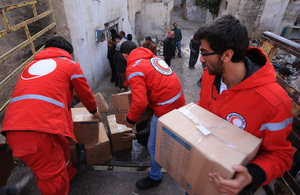 Of all countries, the UK is the second largest provider of humanitarian assistance after the United States. From leading the fight against Ebola in Sierra Leone and reaching people affected by the earthquakes in Nepal within hours, to providing the opportunity for jobs and education to those caught up in the Syria crisis, support from the Department for International Development is saving lives and tackling problems at source – all in Britain’s national interest. Earlier this year, the World Humanitarian Summit brought the international community together to commit to action that will better support and protect those worst affected by conflict and extreme poverty. Building on the success of the Supporting Syria Conference in London, the UK played a key role at the summit, demonstrating Britain’s continued leadership in responding to protracted crises around the world. The crisis in Syria and the region – the UK has been supporting those affected by the crisis for over 5 years and co-hosted the ‘Supporting Syria and the Region’ conference in London in February 2016 which saw commitments to create an estimated 1.1 million jobs for Syrian refugees and citizens in countries hosting refugees such as Jordan and Lebanon. The international community also pledged to ensure that 1.7 million children affected by the conflict will get a quality education. Ebola crisis in Sierra Leone – the Department for International Development led the international response to Ebola in Sierra Leone and played a huge part in helping the country become Ebola-free. Nepal earthquake – due to pre-positioned stock, UK aid was reaching hard-hit communities within hours of the devastating earthquakes in Nepal and has continued to reach hundreds of thousands in need of basic supplies. El Nino – the 2015-16 El Nino effect was one of the worst weather events on record, affecting 60 million worldwide. The UK has been at the forefront of preventing and preparing for the effects of El Nino in the world’s poorest places, by pre-positioning medicine and food supplies and helping people get an income so they can feed their families. Central African Republic – support from the Department for International Development has provided around 800,000 Central Africans and Central African refugees with emergency healthcare, livelihood assistance, protection and food aid. South Sudan – UK aid reached at least 600,000 people in need of life-saving assistance.